Mobile pyrolysis plant is designed not only to produce charcoal, but also for the production of birch tar from birch bark, automotive recycling tires into liquid fuel. As we know the demand for charcoal depends on the season. In the spring and summer of charcoal taken better in winter, worse. Birch tar is always in demand, but in small quantities. His take veterinary hospitals, pharmacies, some enterprises Chemical Industry. On tire recycling products is a constant demand for steel cord, coke (with a mixture of soot). For liquid heating oil needs a constant source of sales. In addition, the tires are not always in large quantities.and for their storage needs more space. Due to the versatility you can optimally allocate mode setting so that it is not idle, and there was a constant sales. 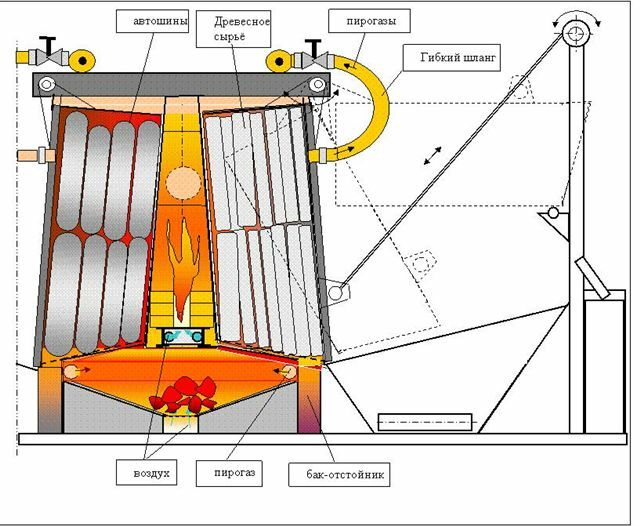 In the production of charcoal in the mobile uglevyzhigatelnyh facilities for people working in them, you have to manually unload the charcoal, wood dust to breathe, which affects their health. Mobile uglevyzhigatelnye installation with a few exceptions, much smoke, emit dymogazy, which contains a number of not dogorevshih combustibles.